Finding a video editing app that is both powerful and easy to use is not as simple as it sounds. Most of the popular video editing software products offer a wide range of tools professionals use in their projects, but learning how to use DaVinci Resolve, Sony Vegas Pro or Adobe Premiere Pro takes a lot of practice and time. Wondeshare recently launched a new software product named FilmoraPro, that strikes a perfect balance between advanced video editing options and simplicity. The app is capable of high-end performances, while its intuitive interface enables even inexperienced video editors to create impressive videos. What Makes FilmoraPro an Excellent Choice for Up and Coming Filmmakers? The process of making a short film, an online video ad or a social media video takes place in several stages, and during each stage, you must use the equipment that enables you to materialize your idea perfectly. In order to go through the post-production stage smoothly, you need to have access to a video editing app that allows you to use all the tools that are necessary to produce a professional looking video. Wondershare’s FilmoraPro seems to be a perfect solution for filmmakers and social media content creators who need access to professional video editing tools, but don’t want to spend a fortune on a video editing app. FilmoraPro is compatible with both Mac and PC computers and you can download it from the Filmora official website first before purchasing the lifetime license for $149.99 or the one-year license at the price of $89.99. The app supports nearly all video file formats, which means that you can shoot your footage with any digital camera and edit it in FilmoraPro. The best part is that you don’t have to be a seasoned professional in order to edit your videos with this app. So, let’s take a peek at some of the most alluring features this software product has to offer. After launching FilmoraPro, you will be asked to either create a new project or open an existing project. Also, you can just click on a project listed in the Recent Projects menu if you want to return to the project you were working on previously. Once you’ve created a new project, you should head over to the Media tab in order to import the footage you’re going to be using in your project. Simply click on the Import button and select the Media option to add a single file to the project or drag the file from the folder and drop it to the Media Panel. Afterward, you can just drag and drop a file to a track on the timeline and start editing it. 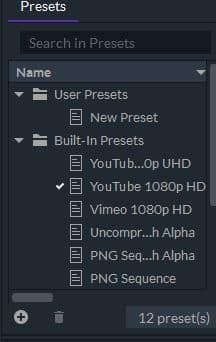 FilmoraPro lets you add as many video and audio tracks to the timeline as you want, which can be quite useful if you are working on a large project that contains a lot of sound and video files. Furthermore, you can control which panels are displayed in the app’s main window from the View drop-down menu, so you can bring up a Trimmer, Scopes or Audio Mixer panels at different stages of the video editing process. FilmoraPro also features a few preset workspaces you can use while performing the color correction, or while creating a soundtrack for your videos. All basic video editing tools like the Selection or Slice tool are located in the toolbar directly above the timeline and you just have to click on a tool’s icon to start using it. 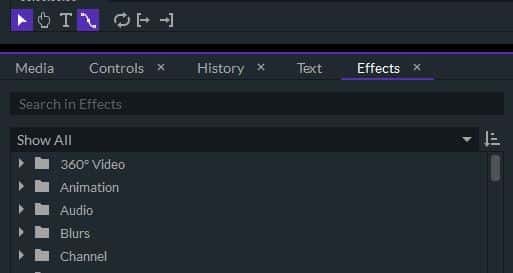 Next to the Media tab, you can find Controls, Effects, Text and History tabs, and after you add an effect to a file you placed on the timeline you can adjust its settings from the Controls tab. The list of audio and visual effects FilmoraPro offers seems endless as you can use these effects to preview 360-degree videos, add blur to a video clip or generate clouds and shadows, among other things. 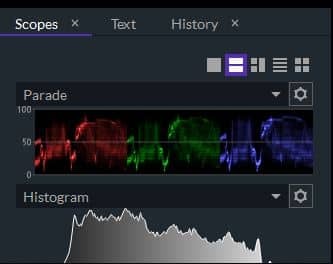 The color correction features are probably FilmoraPro’s strongest suit because the Scopes tab lets you use Vectorscopes, Histograms, and Waveforms while you’re manipulating the colors in a video clip, which enables you to complete this video editing task with a great level of precision. The Text tab contains an impressive font library so you can easily find a font that matches the visual style of the video you’re working on. Moreover, you can control the size and the color of the text as well as its position on the screen, which can help you create captivating openers and end credits. 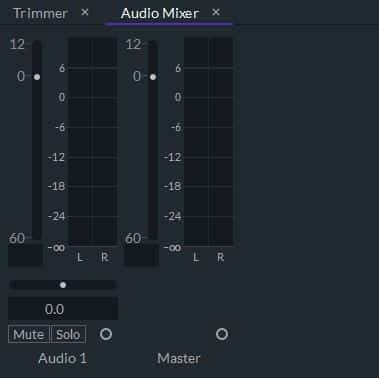 The Audio Mixer tab is equipped with all tools you’re going to need to create a professional soundtrack for your video. You can easily monitor noise levels and even adjust the volume of separate audio channels. FilmoraPro lets you complete virtually any video editing task, regardless of how complex that task is, and you can also use this video editing app to process 4K footage you captured with an action cam or a professional video camera. At different points of the video editing process, you can set In and Out Area so you can export only a small portion of the timeline, instead of going through the rendering process each time when you want to see how the video is going to look like once it is exported. You can add an unlimited number of projects to the Export Queue and pick one of the export presets that enable you to quickly select the export properties that best fit the purpose for which you are going to use that file. You can also create your own presets and use them each time you’re exporting a project for a particular purpose. When you adjust all export settings in accordance with your demands, you can just click on the Start Exporting button. Once the rendering process begins you can head back to the Edit window where you can continue working on the same or some other project. The FilmoraPro offers much more than the basic video editing capabilities that enable you to edit a social media video or any other type of short video. As a matter of fact, the app can be used to edit promotional videos or commercials, because it grants its users the freedom to manipulate their footage in any way they want. 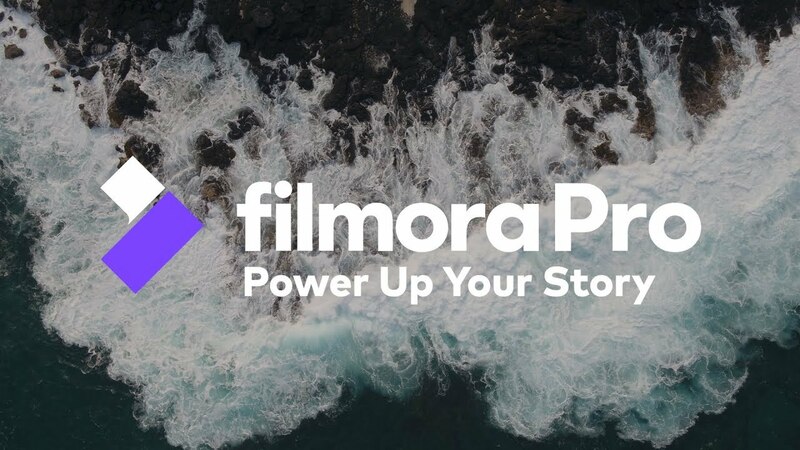 The rich selection of visual effects, as well as the full animation support, makes FilmoraPro an attractive option for both aspiring and established filmmakers in need of a reliable video editing app they can use to edit videos at a professional level.